Contributors. Preface. Chapters 1. An overview of Morone culture (R.M. Harrell, D.W. Webster). 2. Reproduction (C.V. Sullivan, D.L. Berlinsky, R.G. Hodson). 3. Morone pond production (R.M. Harrell). 4. Water quality dynamics as the basis for aquaculture design (D.E. Brune). 5. Intensive culture of striped bass (J.N. Hochheimer, F.W. Wheaton). 6. White bass production and broodstock development (C.C. Kohler). 7. Transportation and stress mitigation (C.R. Weirich). 8. Hybridization and genetics (R.M. Harrell). 9. Nutrition and feeding of striped bass and hybrid striped bass (D.M. Gatlin, III). 10. Environmental requirements and noninfectious diseases (J.R. Tomasso). 11. Infectious diseases of striped bass (J.A. Plumb). 12. Economics and marketing (D.W. Lipton, C.M. Gempesaw, II). 13. Processing and food safety (D.D. Rawless, C.F. Fernandes, G.J. Flick, G.R. Ammerman). Appendix. Subject index. 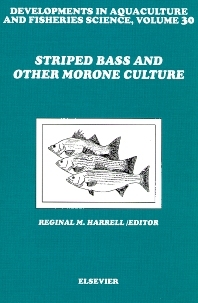 This book is an up-to-date discussion of the culture of striped bass and other Morone spp. The subject matter is broken down into functional components of the spawning, husbandry, and economics of the industry, and is written by some of the leading scientists in each of the respective areas of discussion. The chapters on reproduction, nutrition, environmental requirements, transportation, economics and fish processing are not found anywhere else in the striped bass literature. The chapter on water quality takes a very non-traditional approach to considering the impact water quality has on the production success of Morone and offers some very thought-provoking ideas on water management. Primarily written as a reference work, this book is intended to complement existing technique manuals.